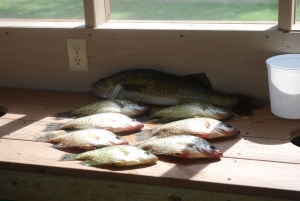 Pelican Lake is well known for great Bass fishing, fantastic panfish-like Bluegill and Crappie, plenty of Northern Pike and an occasional nice Walleye. With over 11,000 acres, more than 50 islands and over 54 miles of shoreline, you are sure to find a quiet bay or shoreline to fish. The majority of the lake is less than 15 feet deep with a sandy bottom and weeds. The deepest spot on the lake is only 38 feet. Several rocky reefs can be found and those along with rocky points are often choice spots for fisherman. Adam is an avid fisherman-especially for Smallmouth Bass- and while he doesn’t get out and fish as often as he’d like, he does slip out for a morning bite or evening top water blitz when he’s able. He’d love to look over a map with you and share fishing stories. And yes, if you don’t have the right stuff, Adam has a small tackle shop in the lodge. Pelican Lake is a great Bass fishing lake! Both Largemouth and Smallmouth Bass have a slot limit (14-20 inch must be immediately released) protecting the breeding fish and giving you a great chance to hook a big fish. For those of us who are primarily catch and release bass fisherman, Pelican Lake is awesome. In the May I recommend soft plastics, crawdad crankbaits and leeches on a lindy rig spinner. June is my favorite time to fish for bass. The bass school together for spawning making soft plastics fantastic around their beds. I personally use a Gary Yamamoto 5 inch Senko-pumpkin seed is my favorite and wacky rig it. Don’t forget the rubber gaskets! Once the water warms up a bit and you see frogs out, try fishing top water. Nothing beats the explosion at the surface when a big bass hits your lure. My favorites are the torpedo, devils horse, a popper, and of course-the Fred Arbogast Jitterbug! In July the water is getting pretty warm and fishing really slows down. But you can still find them in the evenings and mornings. Live bait and soft plastics still work. Once August hits the fishing really slows down. Only mornings and late evenings are decent. Slip bobbers with a leech still seem to work, a Meps spinner, and a buzz bait are your best bets. Don’t worry, September brings the fishing back. Especially once the lake turns the fishing picks back up. Crankbaits, husky jerks and Meps Spinners are your best bets along with live bait in September. Not only is the fishing really good in September, the lake is really quiet. Around to fish in October? Use husky jerks and spinners. Nothing quite gets a fisherman’s blood rushing like hooking a large Northern Pike. 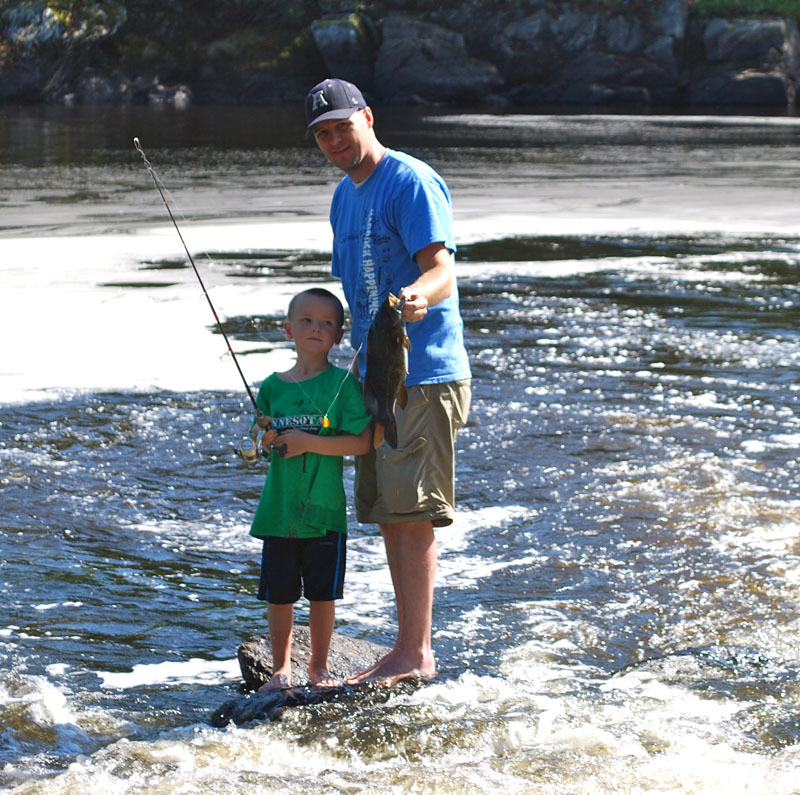 Sure, you are going to catch lots of small ones, but the big ones are out there too. 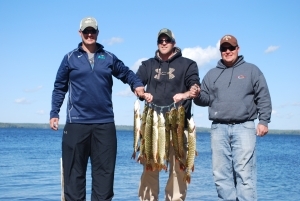 Pelican Lake also has a slot limit on Northern Pike (24-36 inch must be released) meaning there are plenty of fish in the lake for you to enjoy hooking! Pike fishing is best in cooler water, so May is a great month for pike fishing. If you want to catch any pike, throw anything-they’ll hit it. If you want to catch a big one, then throw bigger tackle. Pike like larger husky jerks (nothing smaller than a HJ12), spoons and buck tailed spinners. In June they will move around more in shallower waters where the bait fish are lingering. I personally enjoy throwing a super spook and trying to get them to hit on the surface in June. In July the pike fishing beings to drop off. Smaller pike can still be found and caught on spoons and spinners, but the big ones lurk in the deeper water and are harder to find. In August when it is really warm it can be really hard to find a decent sized pike. But then fall comes… And once the water cools off you can find the bigger fish once again roaming the edge of the weed lines and drop offs. Your spinners, spoons and husky jerks are still great options, but seriously you gotta try a Heddon Super Spook in September and October. Pelican Lake is not known for being a great Walleye lake. There are walleye in the lake, and we occasionally see very nice 20 inch plus Walleye being caught, but not the way we see the pan fish, bass and pike. In the spring go after Walleye around drop offs. Husky jerks and shad raps are your best bets for artificial lures. And of course, bottom bouncing with a jig or a lindy rig spinner with live bait are good bets. Once July comes you have to work the deeper waters, like the deep water around the reef by Bald Island. I personally like a leech or worm on a lindy rig spinner. In the fall you can bust out the husky jerk and shad raps again. Pelican Lake has always had a great reputation as a panfish lake. Monster Bluegill and tasty Crappie are all over the lake. 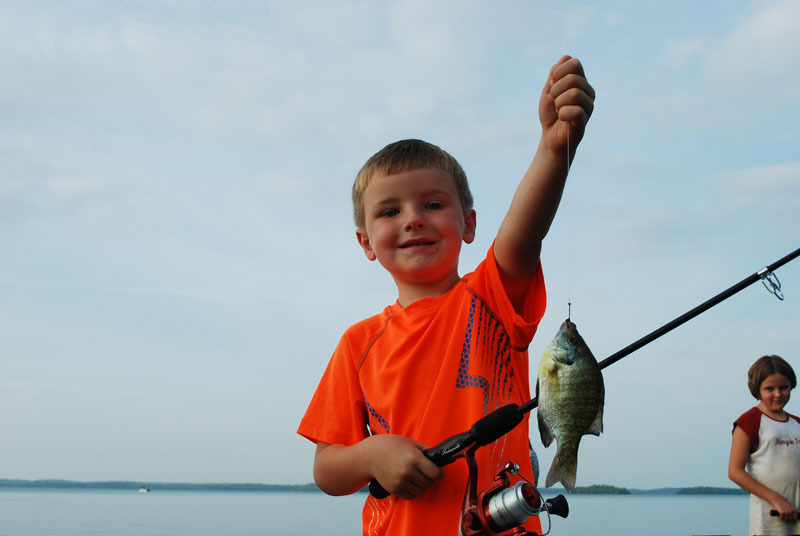 Kids love fishing for perch and bluegill right off our dock. In the spring we fish for Crappie with a bobber and a minnow near Bald Island. Bluegill are a little slower to wake up in the spring, but you can find them once they do 5-8 feet of water. A shiny hook with a piece of worm works best. Once summer really hits, the Crappie fishing is only good in the evening and won’t be great again till September. The Bluegill fishing though stays hot all summer. Those guys love the warm water. Especially on sunny days throw a piece of worm on a shiny hook near any weed bed or dock and if you can get it right next to the structure you will catch bluegill (and probably some Perch). In September get ready to fish for Crappie. Get some crappie minnows and you will find them schooled up and suspended near the reefs on the North side of Bald Island. Don’t forget your net!